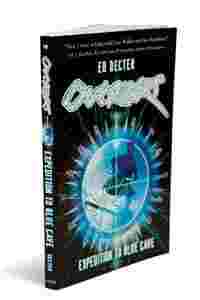 Outriders: Expedition to Blue Cave:By Ed Decter, Aladdin Paperbacks (Simon &amp; Schuster), 182 pages, Rs139. There’s Something About Mary may be many things but dull and routine aren’t among them." This is from one of the reviews about the 1998 romantic superhit. So what is its connection with a just-released children’s book? Outriders: Expedition to Blue Cave:By Ed Decter, Aladdin Paperbacks (Simon & Schuster), 182 pages, Rs139. Ed Decter is the connection. The man who co-wrote the script for the movie has penned his first novel, Outriders: Expedition to Blue Cave, with the same outrageously funny touch that Something About Mary had. Twelve-year-old Cam Walker and his friends, Wyatt, Ty, Shelby, the Bonglukiet twins, Din and Nar, Bettina and Howie, the Bonglukiets’ big mastiff, are the Outriders—a name Cam picked out from a history book on old England. The original Outriders were a band of knights hand-picked by the king of England to ride out to the farthest reaches of the empire to deliver messages and serve the empire. The Outriders spend most of their time scavenging—anything from golf balls to plastic sheeting. They sell these to discount stores and second-hand dealers. The logic: Funding expeditions cost money. Water sliding down the hill is a favourite pastime. One day, Shelby’s father catches her mud-sliding and pulls her out of the gang. The clampdown on Shelby’s movements puts a big dampener on the children’s plans to explore the Blue Cave. The cave gets its name from the weird blue phosphorescent plankton that invades the cave once in seven years, covering it with a blue glow. Cam and friends don’t want to wait till they are 19 or 20 to see it again. If they are to watch it, Shelby has to be freed. The Outriders set in motion the “Free Shelby" plan. What unfurls is an operation that would make wartime generals proud. Cam the prankster becomes Cam the strategist—with an able army. Everything is about to fall into place when they run up against two problems. In the Blue Cave, they meet a robber-couple—Crystal and Jacques—who are trying to hide the Golden Sextant they’ve stolen from Chapman Thorpe, the local millionaire. They retrieve the Sextant and hand it over to Thorpe, only to discover that Shelby’s little sister, Annabelle, has been kidnapped by the thieves. “Give us the Sextant and take your sister back or else…" is their ultimatum. What’s next? Children ought to read this book which brings back good, old-fashioned outdoors fun. “The two hugest mistakes people make are," according to Cam, “kids underestimating the intelligence of adults and adults underestimating the intelligence of kids". The second canon has got the Outriders out of trouble more than once. There are shades of Alfred Hitchcock and the Three Investigators in Thorpe’s interaction with the children. Whether inspired or not, Expedition to Blue Cave is childhood fun at its finest. Look out for the other Outriders adventures. Decter has lined up three more expeditions—To Willow Key, Pine Hollow and Surf Island—all before the end of 2008.